The CT DOT plan to remove the traffic signals from Route 9 in Middletown seems likely to go forward in some fashion, based on the public meeting held on July 26, 2016 and the subsequent comment period. There is broad, enthusiastic support for the main goal from many Middletown residents and elected officials, including Mayor Dan Drew. The pollution, accidents, wasted time, and constant irritation caused by the lights all add up to something now deemed intolerable, so the wheels of state government are starting to move. To view the project on-line, go to www.ct.gov/dot and click on the link “Rte 9 Middletown Projects” on the left side of the home page. The specific proposal does, of course, raise concerns, as any project of this scale would. The most often-expressed concern on July 26 was that increased traffic on Main Street north of Washington Street will make peak congestion even worse. The second most-voiced concern was that the elevated southbound highway near Washington Street will block views toward the river and aggravate the existing visual and psychological barrier between the downtown and the riverfront, the same barrier that we have been decrying and seeking ways to mitigate for the last several decades. Principal Engineer William Britnell explained that CT DOT has received many comments and suggestions that are still under review. In particular, his team is considering additional improvements to the area of Main Street., Grand Street, and Rapallo Avenue to further improve traffic flow, as well as how to avoid the highway elevation that will form a 23-foot wall facing deKoven Drive at Washington St. The fate of the proposed roundabout at Washington Street and deKoven Drive is still in question. The department seems convinced it would move traffic more efficiently and be safer for bicycles and pedestrians, but DOT also sees this feature as somewhat incidental to the project as a whole. Mr. Britnell predicts that sometime this fall the department will be ready to share the results of their studies and deliberations – either in the form of a revised proposal or a confirmed commitment to something close to the original version. Presuming that the concept remains substantially intact, the timeline for the project includes a series of steps to alleviate congestion on Main Street and on Route 9 even before the final major construction takes place. During the 2017 construction season, the CT DOT will install the proposed crosswalk bump-outs that, it says, will significantly improve the function of downtown streets and intersections prior to the changes to Route 9 itself. Congestion will be alleviated, the theory goes, because the bump-outs will allow for decreased signal time for pedestrian crossings and lengthened intervals for the movement of vehicles. With the bump-outs, pedestrians will be safer and feel safer because the sight lines at crossings will no longer be obstructed by parked cars. In 2018, two Route 9 exit turns (northbound onto Hartford Avenue and southbound onto Washington Street) will be eliminated, providing some relief to Route 9 congestion and allowing the public to adapt to the exit changes that are included in the final plan. In 2019, a double lane northbound exit onto Washington Street will be built to further reduce congestion on Route 9 southbound until the underpasses are built. The elevated lanes on Route 9 southbound at Hartford Avenue and Washington Street and their associated underpasses are envisioned to be constructed in 2020-21, allowing for the complete removal of the traffic signals. Widening the Route 17 northbound on-ramp, in order to eliminate the dangerous stop sign that causes so many collisions at that location, has now been postponed until 2022 because the Union Street bridge will be completely replaced. 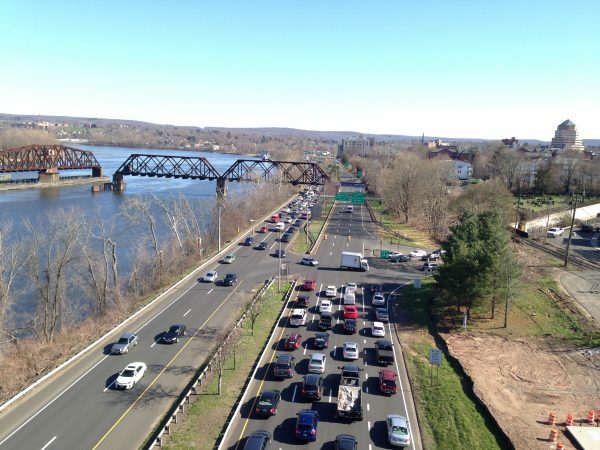 Those who have paid close attention to the issue of Route 9 traffic congestion and access in and out of Middletown are aware of many other visions and solutions for the highway and its problems. From what I can discern, those other proposals involving tunnels, lowered road surfaces, fly-overs, boulevards, and such have been declared too expensive and completely out of the question, at least for this period of our history. What we need to do now is to make this project the best it can be. Our communal vigilance includes making sure that the City of Middletown follows through on funding its part of the pedestrian walkway from Riverside Plaza to Route 9, from where it will be funded by the state to cross over the highway to Harbor Park. This walkway is one way of mitigating or compensating for the obstruction of that 23-foot wall facing deKoven Drive, if that additional obstruction to our relationship to the river can’t be avoided. In short, the pressure of all those traffic jams has mounted to become a regional splitting headache. Whether you like it or not, change is coming to Route 9, and we are beginning to see its outlines.